It's Snowing Early in Telluride this Year! Tours are Open! 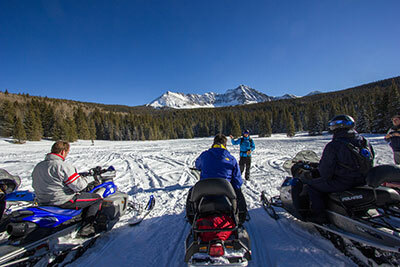 Take the ride of your life on a Telluride Outside snowmobile tour. Telluride Outside offers half day, advanced half day and full day snowmobile tours in the magnificent Beaver Park area between the Wilson and Dolores mountain ranges. Just 30 minutes from Telluride, our Fall Creek snow base is the gateway to seldom traveled backcountry with unmatched riding opportunities and scenery. On most tours, we stop several times to take photos, discuss ecology, observe occasional wildlife and prepare for challenging sections of trail. The scenery simply cannot be overstated. Family friendly tours (half day tours): Our groomed trails and spacious meadows offer a wonderful variety of terrain for riders of any ability. Inexperienced riders enjoy classic touring on wide trails with soft edges and gentle corners. We have few of the tight trees and hairpin turns that characterize other high-elevation tours. Safety is emphasized at every juncture. Our professional guides conduct a concise safety orientation to ensure comfort and confidence while touring. Double sleds accommodate guests who wish to ride along without driving. 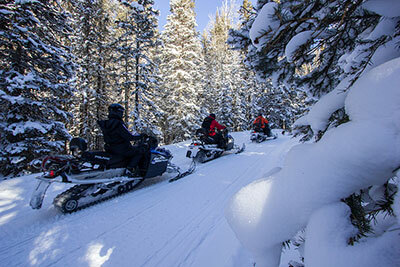 Advanced terrain (advanced half day and full day tours): Experienced snowmobilers are in for a treat. Telluride Outside rides hundreds of acres of advanced terrain in Beaver Park and the Black Mesa area, highlighted by the rolling hills and glades of "The Circus." Experienced riders are advised to consider our 3-hour tour, which allows plenty of time to explore the periphery of Beaver Park's spectacular terrain. Our full day Dunton Tour is also an excellent choice for experienced riders. Dunton Hot Springs full day: Among the great tours of the West, Telluride Outside's full day trip from Fall Creek to Dunton across Black Mesa is a beggar's banquet of Rocky Mountain riding. It should be noted that our Dunton tour is not restricted to advanced riders, but there is seemingly unlimited play terrain and powder shots along this 28-mile cross-mountain route. Upon reaching Dunton, we are treated to a gourmet lunch and hot springs soak in the secluded mountain retreat before riding back across the snowy divide. 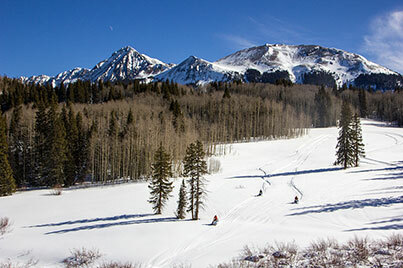 How to Get There: Telluride Outside's snow base is located just 30 minutes west from Telluride and Mountain Village. Clean, safe, comfortable transportation is provided for every tour with door-to-door service in the Mountain Village and convenient meeting places in downtown Telluride. Our vehicles are equipped with studded snow tires for winter driving safety. Guests traveling from Ouray or Montrose may conveniently meet us in Placerville or Sawpit. Our snowmobiles: Telluride Outside features a fleet of new model Polaris snowmobiles in both touring and powder riding models to suit the variety of terrain offered on our diverse tours. Our machines are scrupulously maintained by equipment manager Roger Young, a born-and-raised West Slope snowmobiler who has worked with Telluride Outside for over twenty years. Polaris 600 RMK: the right tool for the job. Telluride Outside’s “Advanced Half Day” and full day snowmobile tours are completely unique in the Telluride area. In most snow conditions, these tours offer the opportunity for extensive off-trail riding, sometimes in deep powder. To enhance the experience, Telluride Outside has purchased brand new Polaris 600 RMK snowmobiles for these extended tours. The 600 RMK is an acclaimed powder riding machine that offers more horsepower and a longer track than comparable touring machines. Handlebars and running boards are specifically designed for either sitting or standing, giving the rider greater command in aggressive riding situations. 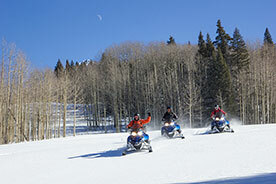 Experienced snowmobilers will be rewarded in their choice of an advanced half day or full day tour. What to wear: Dress like you're going skiing. A snow suit or snow pants and parka will keep you warm on a wintery ride. Goggles and a warm hat are important for safety and comfort. Your snowmobile has heated hand grips, but guests should wear insulated gloves. Warm socks and winter boots are a must. For your convenience, Telluride Outside offers a selection of high quality snow suits and boots for guests who do not have their own. **drivers on double sleds must be at least 21 years of age. Piggyback riders must be at least 6 years old. *Door-to-door times including transportation, safety talk, tour, hot chocolate and return transportation. Accident repair cost policy: Guests are responsible for reimbursing Telluride Outside for damage caused to snowmobiles while on tour.